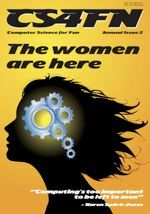 Women have been at the forefront of computer science and electronic engineering from the outset. At the moment too many girls have been believing the stereotypes, which just leads to a self-fulfilling prophecy. Fortunately many ignore them and are continuing to be as successful as the women of history. Here are links to our resources that celebrate some of the great women of the past and present, highlighting the work of top researchers over the decades and also profile some students who are set to continue the trend. Women may not always shout about their achievements, but boy do they do it well! As leading computer scientist Karen Spärk-Jones said: “Computing’s too important to be left to men”.